This is an eye-catching theme that is perfectly suited for Nonprofit and Church websites. Designed by WPlook Studio using CSS3 technologies and HTML5, it comes with many inbuilt options including 11 custom post types, an online store, multilingual options and a child theme included. Needless to say, it ensures that the website works perfectly and remains future-proof. 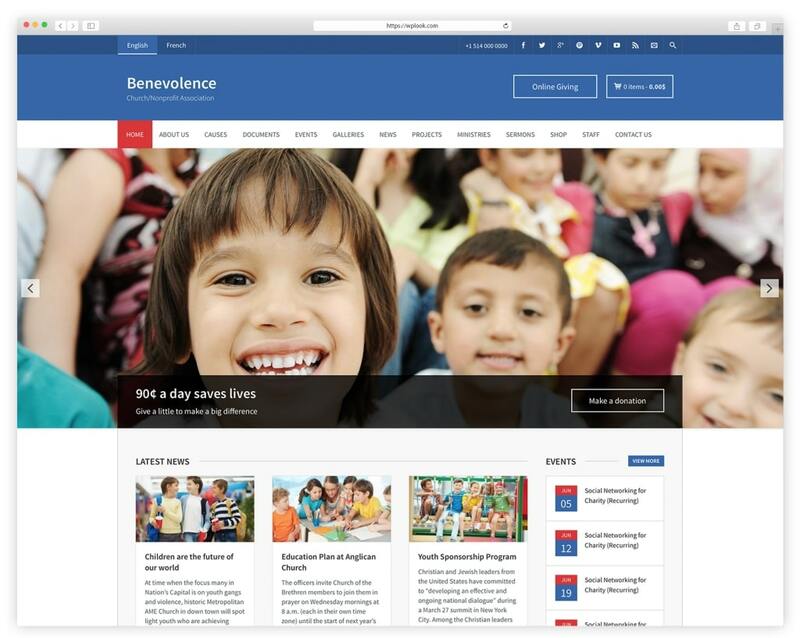 When using Benevolence WordPress Theme, it is easy to incorporate galleries, sermons, donations and other church projects to the website. The theme is also incorporated with PayPal, making the acceptance of church donations easy. This amazing WordPress theme is the perfect choice for everyone looking to create a great website for church or any other non-profit organization. Charity is a powerful and well structured WordPress multipurpose nonprofit theme that is bright, deeply engaging and graphically expressive. The bold and careful construction makes Charity extremely user-friendly and responsive. As a theme that works well across all spectrums, Charity has powerful features that showcase different aspects such as project and staff showcasing, sophisticated gallery options and geo-location. The theme outshines its competitors in terms of fundraising options, templates, features, and functionality. 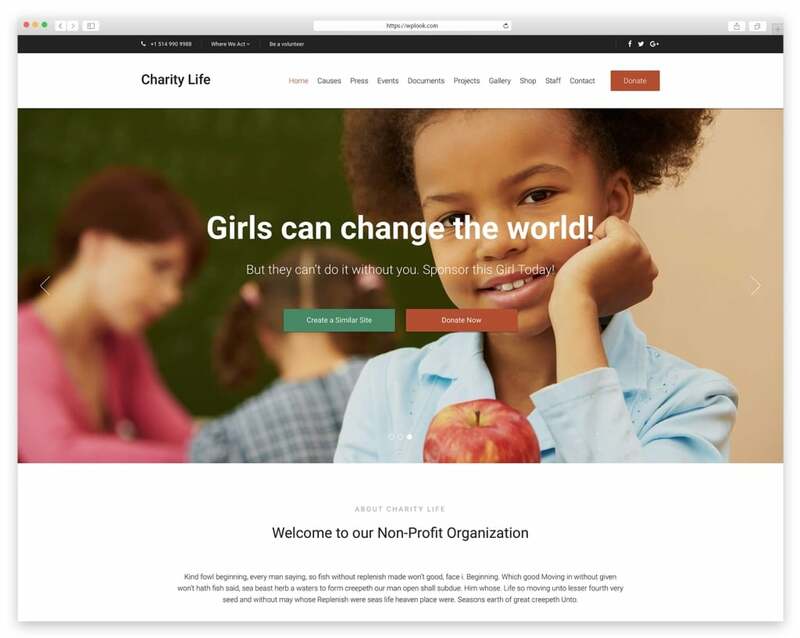 Charity WordPress Theme also has WooCommerce support, an aspect that makes it reliable for expanding fundraising campaigns. Custom share buttons will let your visitors share your content. Get Charity today and start creating the church website you’ve always dreamed about. The theme is translation ready which means that you can translate it to any language you need. Create your own online shop on your website. (WooCommerce integration). Select your own colors with Unlimited color options. Charity has the option for recurring donations. Showcase your active and past projects. Publish a different kind of documents. 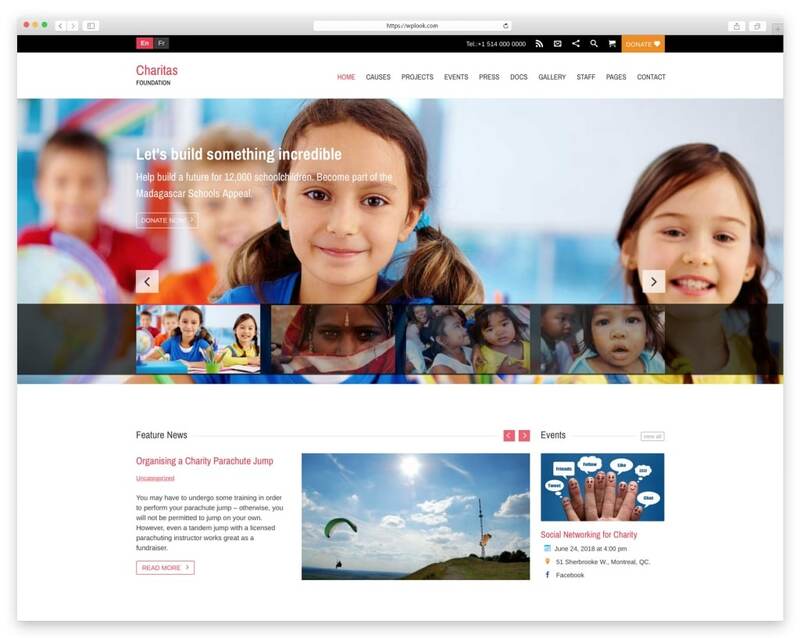 Charitas is a charity WordPress theme that is simple, unique and highly professional. 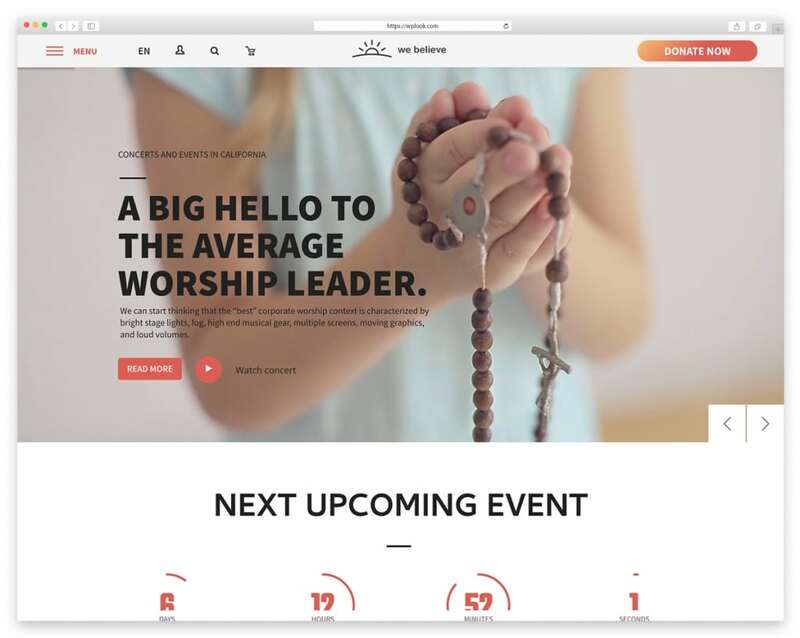 It is ideal for a church or nonprofit organization that desires a modern and eye-catching website to tell their stories as well as raise funds. Just as its title suggests, Charitas is better-suited for charity-oriented purposes. It comes with 7 custom post types, an online store (WooCommerce), child theme and it is also integrated with PayPal. You can choose from the available packages that theme has like Standard, Developer ( most popular) and Club Member. If you will need help with the installation, hosting or other support questions WPlook team will help you. Charitas is extremely fast as well as multilingual ready and it will certainly take any website to the next level. With a bunch of great features, Charitas WordPress theme has its well-earned place in the Best Church WordPress Themes list. Present and promote your team members. Child theme is included, so you can make changes without changing the code or the files in your original theme. This is an impressive Premium theme which immensely improves any church or nonprofit website. It will surely help you to create fundraising campaigns and more. With an easy installation process, Charity Life can also be used by users who do not have any experience with website creation. Charity Life facilitates the collection of automatic donations and its incorporated PayPal support ensures that all users have a unique experience. The layout easily adapts to mobile, laptop and tablet screens. With the option to personalize the page’s color palette, this theme paves way for a standout site. Having Charity Life theme means top-notch support, outstanding design and great features for a church website. Create a multilingual church website in multiple languages. Attitude is a fresh and simple WordPress theme suitable for non-profit organizations and churches that is characterized by a simple, clean and responsive design. It adapts automatically to tablets and mobile devices. The theme is also easily customizable and comes with numerous options such as a variety of layouts, widget areas, templates, social icons and a slider to highlight the website’s pages. 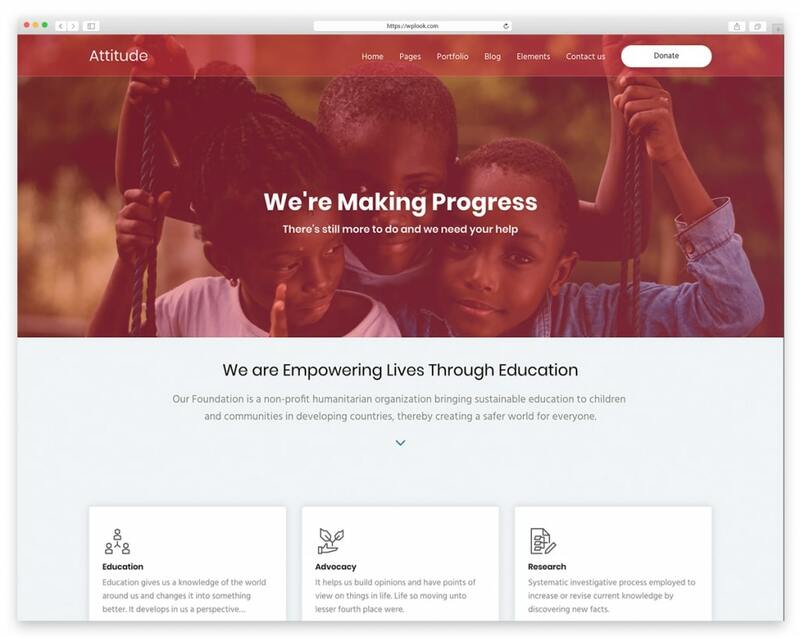 This multipurpose nonprofit website theme is fresh and modern-looking. It is easy to style almost everything from the settings page and its visually oriented interface makes it one of a kind. Get Attitude today and have a professional church site in no time. Attitude WordPress Theme includes Drag and Drop Page Builder that helps you build any page fast and easy. You can have your nonprofit website in any language. The Theme Customizer allows you to preview changes to your site before publishing them. Attitude WordPress theme is very easy to install. It has a responsive design which means your website will adapt to any screen sizes. Grace is a visually clean, modern and rapidly responsive WordPress theme that is perfect for church and religious websites. It was created to empower religious officials to quickly and easily set up professional quality websites that are visually appealing, animated and have powerful functionality. 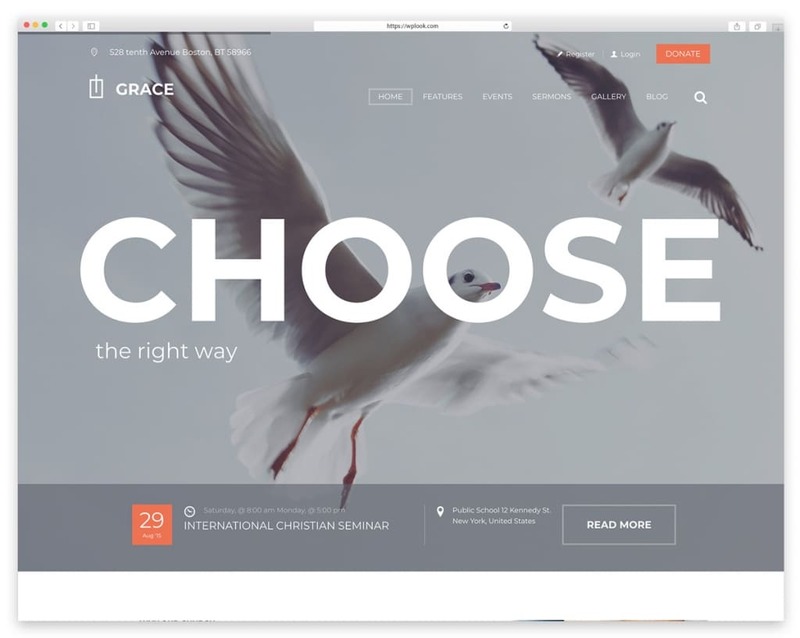 Grace offers all the tools that can customize and modernize the look and feel of a church website. With premium plugins and features such as the drag and drop page builder, event widgets as well as the code based bootstrap, the website will look splendid at every time. Grace WordPress Theme is very easy to install and has a mobile device optimization. It includes an abundance of features and is generally straightforward. You can build multiple sites with this theme and have each one look and feel unique. The theme is integrated with Visual Composer, so you can organize your pages exactly the way you want. SEO optimized that makes Grace theme optimized for various ranking factors Google and other search engines. 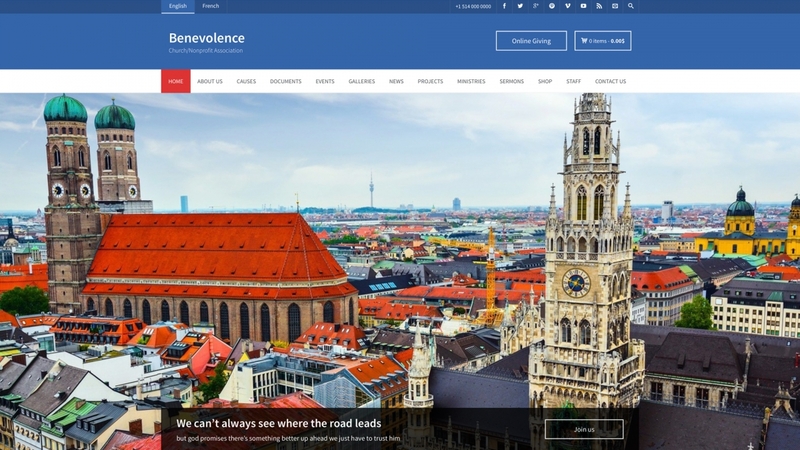 WeBelieve is a clean and modern WordPress Theme build for churches, fundraisers, charity and non–profit organizations. It is a powerful and well-designed theme with a great multiplicity of options. WeBelieve is fully integrated with the Visual Composer which means you can easily build pages, add images and more with drag & drop page builder. WeBelieve Theme is fully responsive based on Twitter Bootstrap framework that makes it available for all screen sizes from the bigger ones to smartphones. This nonprofit WordPress theme is well documented and the team that created it provides amazing support. The theme is one of the Best Church WordPress Themes and will definitely be a good choice for your website. Fully responsive theme based on Twitter Bootstrap framework. Publish multi-day events with a flexible event management system. Make donations via direct card or PayPal. It has a powerful and customizable sermon manager. A multilanguage support which means you can translate the website into different languages. 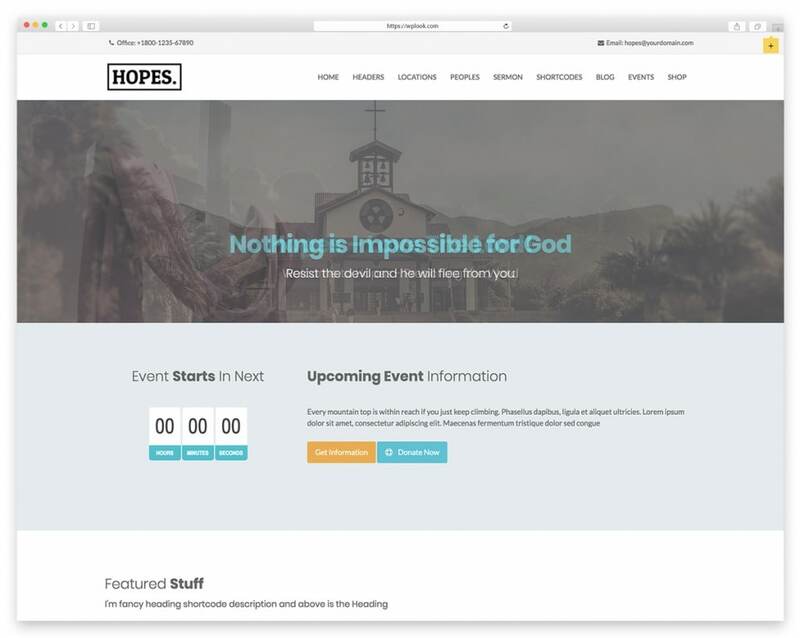 Hopes is a responsive, multipurpose WordPress Theme perfect for churches, nonprofit and religious websites. It is compatible with devices like iPhone, iPads, Smartphones, and Tablets with portrait and landscape. The theme is packed with premium plugins like Visual Composer and Slider Revolution. It is compatible with Event Calendar a popular WordPress plugin for event management and calendar display and it’s in use with religious and nonprofits organizations. Hopes is integrated with Visual Composer, a popular page builder to build responsive pages without any coding. You can translate the theme into any language as it is tasted with WPML plugin. This theme is easy to set up and well documented. It is SEO Optimized and has unlimited colors selections. Testimonials Post types for displaying testimonials in separate page and carousel and lists style. 9 Post Formats (Standard, Aside, Audio, Link, Image, Gallery, Quote, Status, Video). Over 500+ Google fonts offered with the theme. The theme has a Blog Page Template. Submissions for testimonials which will be posted by visitors. For many churches and nonprofits, WordPress offers a professional website that translates into a stunning online presence. Besides that, it is an affordable option that has also proven to be the right solution for charity, fundraisings, and donations. It is also characterized by ready to use plugins, restore features and a reliable support system. Church websites are meant to be dynamic and these WordPress themes do not disappoint. I hope you found your perfect Church WordPress Themes on the above list and you are ready to start creating an amazing website!